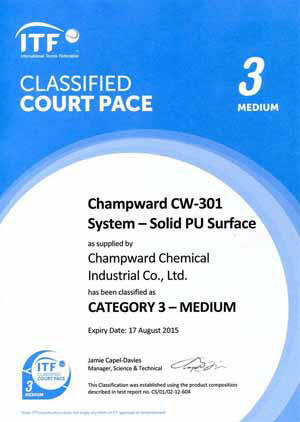 This System has listed in ITF as "Category 3" in court surface classification. relatively low maintenance. Suitable for multiple-use indoor and outdoor sports surfaces. This System has list in ITF as "Category 3" in court surface classification. Matt/Glossy Smooth Surface Gymnastics, Aerobics, Volley Ball, Basketball, Hand Ball, Futsal (Five-A-Side Soccer), Badminton, Table Tennis, etc. Matt/Semi-Glossy Medium Texture Tennis, Volley Ball, Basketball, Hand Ball, Futsal, and Multi-use Playground. Matt Full Texture Track, Runways, Various Ball Games: Tennis, Volley Ball, Basketball, Hand Ball, etc., and Multi-use Playground.